Stromberg GFRC offers the largest selection of planters in the world. We have a number of very versatile designs available. You can peruse our gallery to pick one out and order it now. Should you have a particular design in mind, custom orders are available. If you have no design but want something no one else in the world will have, Stromberg designers can fix you right up. Give them your conceptualization of the planter, and they will design something to suit your needs. These planters can act as accents in the garden or inside the building of such places as hospitals, colleges, universities, and restaurants. Simple planters accent the greenery inside. 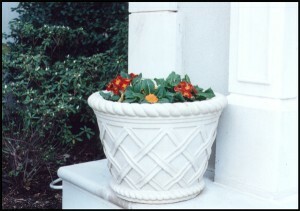 Ornate planters draw attention to themselves first, the plants second. In addition, planters can be strategically placed in an outdoor setting to act as barriers to automobile traffic and to to encourage pedestrian traffic flow. Finally, they can be used as a blast mitigating barrier. The GFRC absorbs and dissipates the shock wave from the blast, protecting nearby people and structures. For more information and assistance with ordering your planter, please call us at (903) 454-0904 today or email us at info@strombergarchitectural.com.